Get Through MRCGP: AKT provides prospective candidates with a wealth of practice material for this relatively new examination, covering all the different question types that are encountered in the actual examination. The questions are divided into papers for ease of use, and, in order to give the reader a really useful revision experience, the author has concentrated on the themes and subjects which candidates often answer poorly. It is improvement in a candidate's areas of weakness which will allow them to pass the exam. To this end, the author has included extended explanations in the answers section, especially in subjects where candidates often perform poorly. This allows candidates to gain confidence answering these more challenging questions, which may be the crucial ones in any exam. 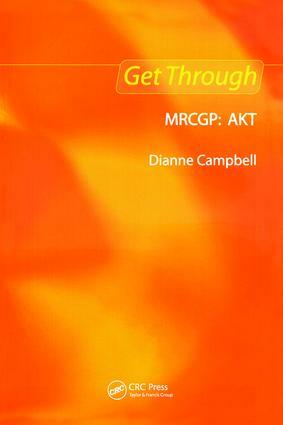 Providing the reader with an invaluable bank of material to help them achieve success in this exam, Get Through MRCGP: AKT is an essential revision guide for all GPs preparing for the Applied Knowledge Test. Well planned and structured book concentrating on the tougher topics in AKT. Questions are in groups of 100, which can be used to do a mock test too. Good explanations with answers. If you manage to do well in these topics, you have a good chance of passing. I would recommend it to all those appearing for the AKT. This is an excellent book for the AKT. I learnt loads, and spent hours going through all the detail in the answer section. Answer section has thorough explanations - it doesn't tell you to read it up somewhere else - it gives you the information then and there - making revision much more efficient. Provides useful ways of remembering information. This book gives a good coverage of various topics for AKT at an affordable price. I especially found the various tips given in the beginning of the book useful. Overall, good value for price and recommended.